The award-winning Lifespan TR5000i treadmill has been hailed as one of the most innovative new models on the market while receiving outstanding reviews for its superior motor and overall value. Readouts for time, calories, distance, heart rate, and more appear large and bright on the multi-color LCD display. Two heart rate control workouts and two custom user programs are included among the 20 workout segments that can be used at three different intensity levels. UPDATE: As of 2017 it looks like the TR5000i is no longer available and has been replaced with the upgraded TR5500i. Check out the new model here. 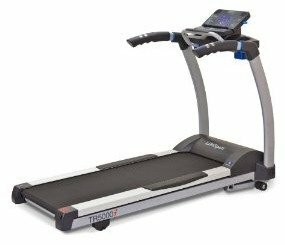 The Lifespan TR5000i treadmill has the heavy duty components to qualify it for use in a light commercial facility (up to 3 hours use per day): a 3.0 continuous duty hp AC drive motor, an incline lift motor with an 800-lb thrust rating, 2.5" front and 2" rear rollers, a 1" phenolic reversible deck, 8 bumper suspension, a 2.5mm thick 20" x 60" running belt, speed up to 12 mph, and a 350-lb maximum user weight capacity. The Intelli-key feature on the display console has lights that flash automatically showing you which button to push to proceed through each workout set up. The treadmill has four quick select buttons for speed and four quick select buttons for incline control. The audio package includes audio in and audio out jacks to use with MP3 players or other audio devices. In addition to workouts grouped by goals (Healthy Living, Sports Training, Weight Loss, etc. ), the Lifespan TR5000i comes with two My Zone™ heart rate control programs that let you monitor your heart rate effectively to safely achieve your cardiovascular fitness goals. Purchase of this treadmill includes a free Lifespan Fitness Club membership. This is an online health management program that includes a free USB stick to transfer your workout information from the treadmill to your PC. Every 20 seconds, the computer records your workout data (heart rate, miles, calories burned, etc) on the storage device, which you can then upload later at your leisure to your personalized online account. A comprehensive user manual is included that gives helpful tips on exercise guidelines, detailed program overviews, and troubleshooting tips, as well as instructions on how to use the machine. Normally priced from $1,899 to $2,499, the Lifespan TR5000i has a commercial quality AC motor that offers better efficiency and power than the standard DC motors most often installed in residential models. It delivers powerful but cool-running torque at low speeds, although the noise level will be more pronounced than what you find with DC motor treadmills. Furthermore, the warranty is outstanding and the price is perfect for the value the TR5000i delivers. If you are a runner in need of a machine that can take a daily pounding, the Lifespan TR5000i treadmill fits the bill.